After an exhilarating day of adventure in Beng Mealea, it was finally time to visit Angkor Wat. 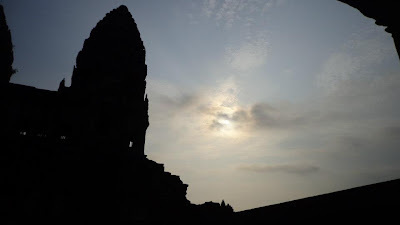 This leg of my Cambodia tour was what I was eagerly waiting for. 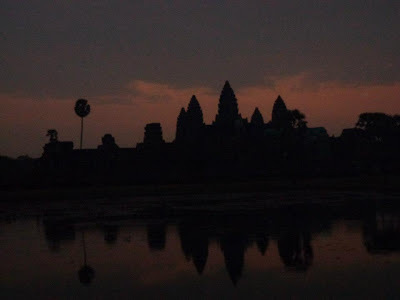 I started out early to catch the magnificent sunrise over the ruins of Angkor Wat. I was picked up by my guide at my hotel with a tuktuk in tow, which were all provided by My Way Travel during this one day Cambodia Tour. The long wait before the sunrise came was uneventful, but there were a LOT of people already waiting as early as 5AM. people jostled for position just so they could get the best angle of the romantic Angkor sunrise. Words and pictures are not enough to describe the wonder that this spectacle offers. Waking up at 4AM was definitely worth the trip. The sun was up and I was now psyched to explore the ancient ruins of Angkor Wat. The guide that My Way Travel provided spoke good English and gave background information about the Angkor complex. He also threw in a few jokes and had a good understanding of Angkor Wat. It was still a bit dark when I entered the complex. 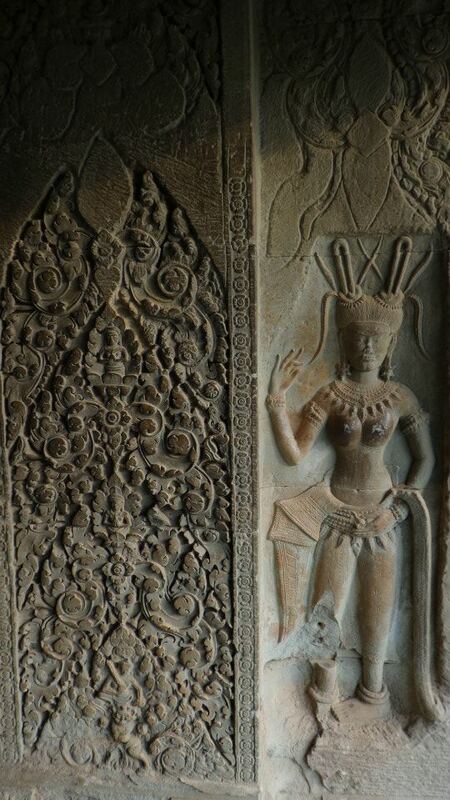 You can feel the history hiding behind the walls and in the many carvings in Angkor Wat. The walls told stories and myths that were only written in books before I made my visit. 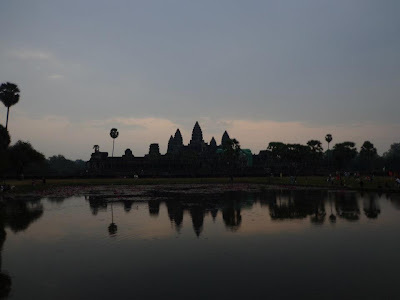 Angkor Wat is the largest religious complex in the world. This Hindu temple was built by the Tamil King Suyavarnaman II in the 12th century. 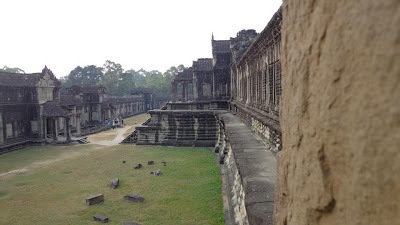 Angkor Wat was dedicated to Vishnu, and was well maintained for hundreds of years. The temple slowly transitioned from a Hindu temple to a Buddhist one after hundreds of years. 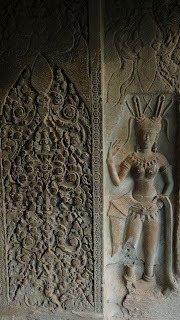 There were several carvings of Hindu mythology scattered throughout the different floors of Angkor Wat. 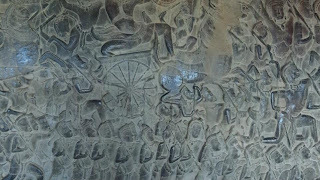 Guests can clearly see the painstaking process of carving these stories on the wall. 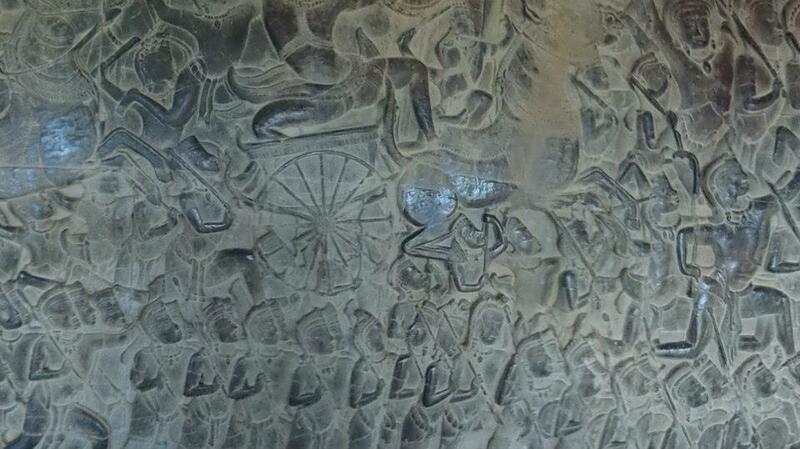 Angkor Wat had several stories carved on its walls which made it an even more important monument. This temple was also an oddity because it faced west and not east, which led many to believe that this temple was supposed to be used as a burial site. Angkor Wat had several libraries scattered throughout the complex. You can see the vast walls that stretch for yards. The complex is huge and is also surrounded by a moat that protected it from the trees that have encroached other temples in Cambodia. After diving into the ancient history and culture of Angkor Wat, we traveled to Angkor Thom to see more of the temples. 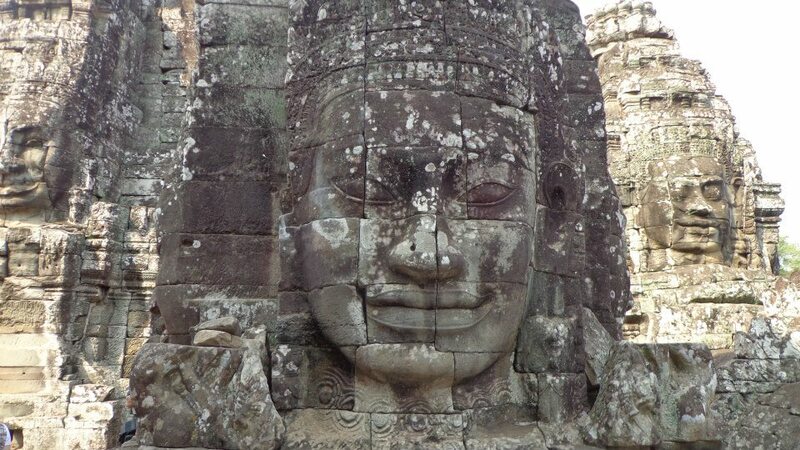 Angkor Thom was the last city of the ancient Khmer empire. 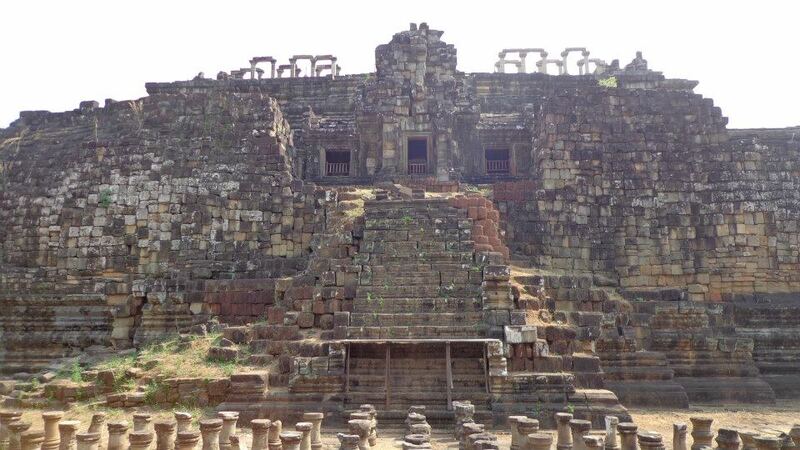 It was built in the 12th century by Jayavarman VII and spanned 9 sq. kilometers. 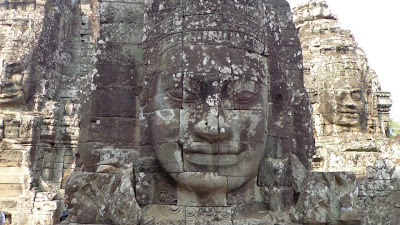 Angkor Thom was the capital of King Jayavarman VII's kingdom, and was home to more than a million people as my guide stated. 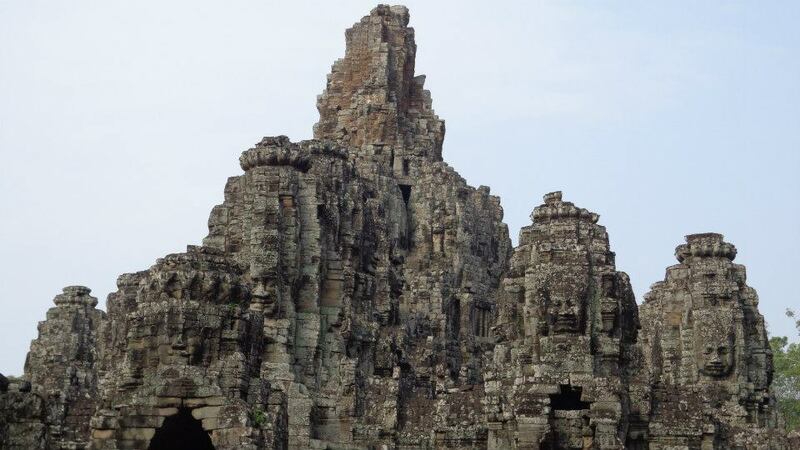 Angkor Thom had several temples in its vicinity, the most popular of which is the Bayon. This temple contained several Buddha faces and bas reliefs that depicted history and everyday life of the Khmers. The monument had 37 towers but not all of them had Buddha's face. It was surreal walking amidst all of the Buddha faces looking at you from different angles. 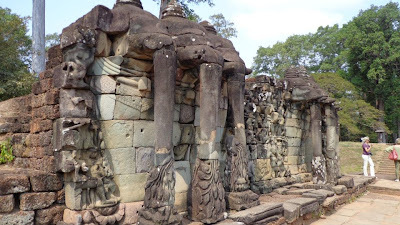 After the Bayon, the Cambodia tour led us to other temples such as Baphuon, Terrace of Elephants, Phimeanakas, Takeo, and the Terrace of Leper King. 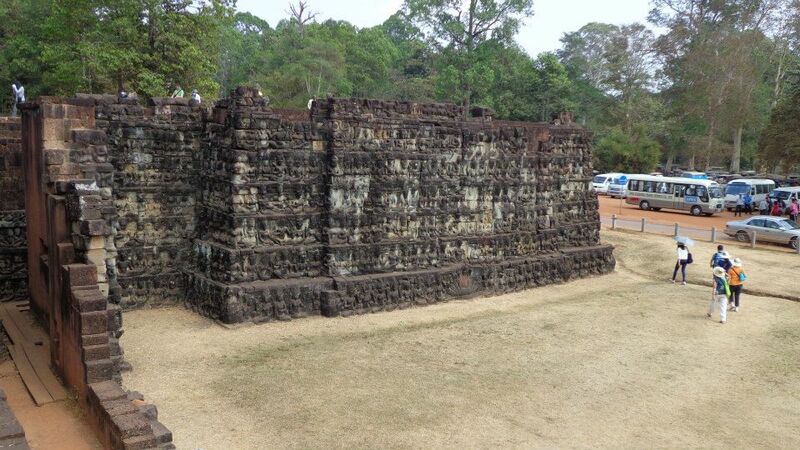 Baphuon was built in the 11th century by Udayadityavarman II and dedicated it to the Hindu god Shiva. 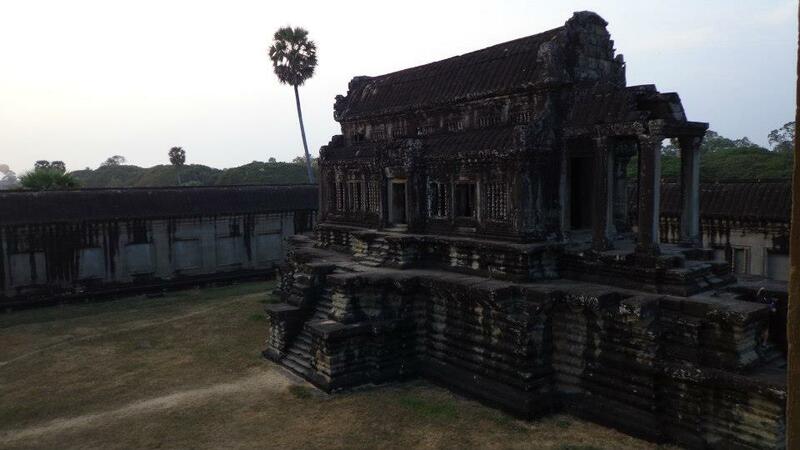 This terrace was the place where the king greeted the incoming victorious army of the Khmer empire. The temples were a sight to behold because of the culture and many stories they tell. Guests can see the rise and fall of the Khmer empire because of the ancient ruins. It is plain to see that no matter how large or advanced a kingdom or era is there will be a time when it falls and remains just a shadow of its former glory. 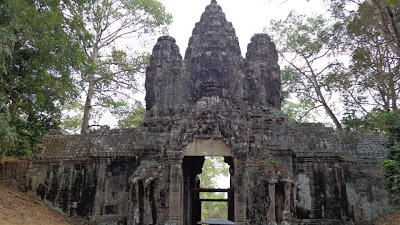 I'd like to thank My Way Travel that provided me with a knowledgeable guide (the guide also knew how to take good pictures in the right angle and pose) and a chance to go on this Cambodia tour. I highly recommend them because of the service they provide and the guides that are knowledgeable and accommodating. What a creepy place but it's really amazing. I hope one day I can be at cambodia too. 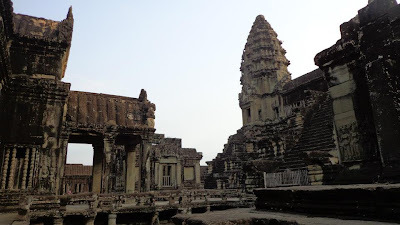 It was way better to have a guide to appreciate the rich history of Angkor Wat. Been there twice, once with a guide and the other time without one. I have heard so much good about this place and your post truly proved it, the place is not just a history but lovely too. will it cost you much to have a tour guide? or affordable in any way? @MIMIDEAR: The tour guide costs somewhere between $20-$25 and you have to book them in advance, hope this helps. What will you recommend? DIY or Guided tour? @Tripsiders: If you're going by yourself get a guidebook and DIY but if coming with a group (3 or more) get a guide because you can share the expenses with other people. A guide interjects comments that you can't find in a guide book. Amazing structures in Angkor Wat.. i still wonder how the early people in Cambodia was able to build structures like these. Wow, the place is breathtaking. I wonder when i can go there..
Wow! 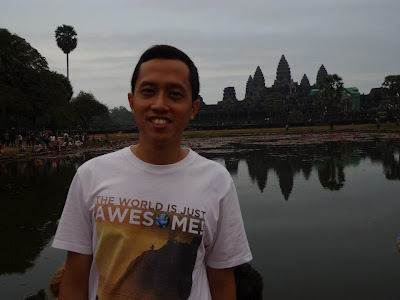 Ang ganda naman ng place :) I've always wanted to visit Cambodia! IT's in my bucket list. Angkor Wat, a very mystical place to visit. sana makita ko rin yan. Very nice.. I've been here twice already. What's the difference between the Terrace of the Elephants and Terrace of the Leper King storywise? panu po ang magpabook ng tour sa mga temples?